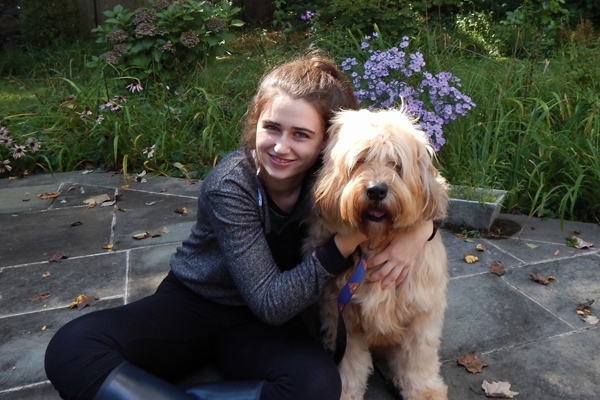 Annie Blumenfeld is on a mission to prevent heartworm disease in dogs. She is the founder of Wags 4 Hope, a non-profit aimed at raising awareness about heartworm prevention. Through her non-profit, she changed Connecticut state legislation regarding heartworm prevention and raised over $37,000 for multiple animal rescue organizations. She is eloquent, intelligent, determined, and deeply cares about the lives of animals. She is also 17 years old. heartworms. For Teddy, this diagnosis meant suffering through multiple shots of an arsenic-based medication that kills heartworms, and being severely exercise restricted for months. For Annie, hearing what Teddy had gone through broke her heart and inspired her to create Wags 4 Hope to prevent other dogs from undergoing this preventable illness. So, what are heartworms? Heartworms are parasites that infest the lungs, heart, and major arteries of several animals including dogs. They are spread through mosquitoes. A mosquito bites an infected animal and ingests immature worms called microfilaria. The mosquito then bites a second animal, and the microfilaria enter the animal through the bite wound. Over 6 months, the larvae develop into adult worms. These adult worms cause respiratory and cardiac problems in animals, and if left untreated, can lead to death. The silver lining? Heartworms are preventable. One of Annie’s main goals is to teach pet owners about heartworm prevention. Heartworm prevention is easy – pet owners simply give an inexpensive preventative medication once a month to their pets, often in the form of a delicious tasting (well for the dogs) soft treat. To put the cost of heartworm prevention versus treatment in perspective, Annie states that “a year’s worth of monthly heartworm preventatives is equivalent to a week’s worth of Starbucks coffee runs”, whereas heartworm treatment ranges from $600-$2000. Annie uses her website and social media as a platform for preventing heartworm disease. She posts on her blog every month, reminding owners to give their pets their heartworm preventative. Additionally, she has given numerous interviews and been featured in different magazines and news programs where she shares her message. She also started a Wags 4 Hope chapter at her high school. Most impressively, she recently went before the Connecticut House of Representatives to petition them to give heartworm prevention information to pet owners, an action that resulted in the department of Agriculture mandating heartworm preventative messages be put on dog license applications. As if all that wasn’t impressive enough, Annie also is an artist and uses her creative skills for the greater good. She sells pet portraits through Wags 4 Hope and donates all her earnings from these paintings to various rescue organizations and shelters. Annie’s portraits capture the essence of the animals; the trick of which she says is spending a lot of time on the eyes to capture the expression of the pet. I asked Annie what her future plans are, both for Wags 4 Hope and for herself. Her goals for Wags 4 Hope are to continue raising awareness about heartworm prevention, and to find ways to help lessen the financial burdens of families who have to pay for heartworm treatments. As for her own future, she plans on attending college to study business and politics. While in college, she also plans on starting a Wags 4 Hope chapter on her college campus. I predict that Annie’s determined and generous spirit will result in a bright future for both herself and thousands of heartworm-free dogs. Before the service member leaves, discuss veterinary care and potential expenses. If the dog is currently on heartworm preventatives, continue giving the preventative every month. If the dog is not on a preventative, get the dog tested for heartworms (a simple blood test). If the dog’s test comes back negative, then begin monthly heartworm preventative treatment. If the dog is heartworm positive, talk to the vet about treatment options and costs. Proceed with the appropriate treatments, based on the recommendation of the vet and the approval of the owners.